The Hero Destini 125 has been completely designed and developed in-house at Hero MotoCorps R&D centre in Jaipur. Hero MotoCorp has launched the company's first 125 cc scooter, the Hero Destini 125 and prices start at ₹ 54,650. The Destini 125 is available in two variants LX and VX. While the LX is priced at ₹ 54,650 (ex-delhi), the VX costs ₹ 57,500 (ex-showroom Delhi). Deliveries for the scooter will start in three to four weeks. The Hero Destini 125 is the first scooter in the market to come with the automatic start-stop system, termed i3S by Hero MotoCorp. Hero claims a real-world fuel efficiency of 51 kmpl from the new Destini 125. The Destini 125 has been completely developed in-house at the company's Centre of Innovation and Technology (CIT) in Jaipur. Visually, the Hero Destini 125 resembles the 110 cc Hero Duet, but only the silhouette and dimensions are similar. The body panels, styling and other details are all new, although the suspension and brakes from the Duet have been tuned further to serve the 125 cc scooter. The Destini 125 was first showcased as the Hero Duet 125 concept at the Auto Expo 2018 in February this year, along with the Hero Maestro Edge 125. In terms of features, the Hero Destini 125 will includes Integrated Braking System (IBS), side stand indicator, service reminder, pass switch, external fuel filling and more. The VX comes with boot light, mobile charging point, chrome garnishes, cast wheels and dual tone seat covers. So far, the Destini 125 will only be available with drum brakes, but Hero officials haven't ruled out the introduction of disc brakes if there's significant customer demand for that feature. 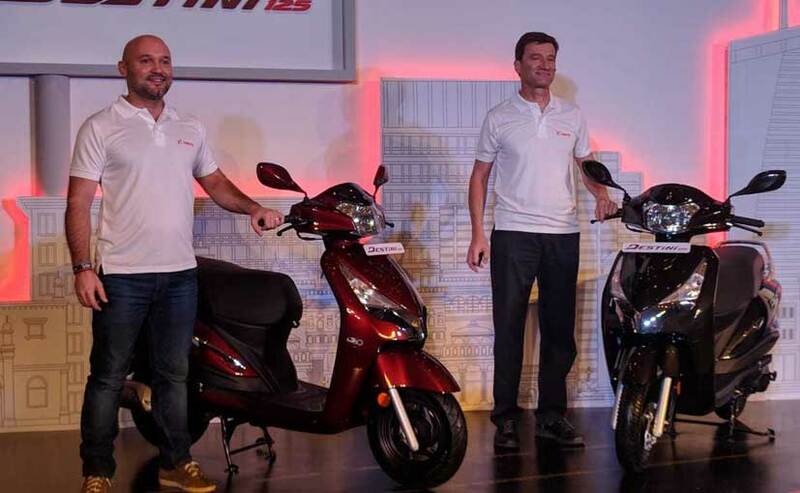 Malo Le Masson - Head of Global Product Planning, Hero MotoCorp Ltd., said, "The scooter market is witnessing a shift towards products with higher engine capacity. The 125cc segment in particular has been expanding at a rapid place, witnessing a growth of over 75% year to date, this fiscal. The 125cc segment, therefore is a focus area for us and we are strategically following a multi brand approach in this space. In keeping with this strategy, we have debuted today in this category with the Destini 125 and will soon introduce another scooter towards the end of the year." The next 125 cc scooter from Hero will be the 125 cc version of the Hero Maestro Edge, which will share the same engine with the Destini 125, but will also be available with disc brakes on the top-end variant. The Maestro Edge 125 will be launched by December 2018, or early 2019. Powertrain wise, the new Hero Destini 125 is powered by a new 125 cc single-cylinder, air-cooled engine. The engine offers 8.7 bhp at 6750 rpm and 10.2 Nm of peak torque available at 5000 rpm, and has been tweaked to offer better low-end power for higher urban usability. Maximising fuel efficiency, the Destini 125 is the first Hero scooter to get idle-start-stop-system (i3S system). Hero officials say the Destini 125's engine is completely all-new and is not a bored out version of the Hero Duet. Dr. Markus Braunsperger, Chief Technology officer, Hero MotoCorp ltd., said. "We are introducing the new Destini 125 scooter, within just a few weeks of launching our new premium motorcycle- Xtreme 200R. This clearly demonstrates our robust in-house competency in designing and developing products in the premium segment. The Destini 125 is the only scooter in India today to offer the revolutionary i3S technology, in addition to providing a perfect balance of power and style. We have a strong pipeline of new products in both scooter and premium motorcycle segments, which we will launch in the coming months." The Hero Destini 125 goes up against the likes of the Suzuki Access 125, Honda Activa 125 and even the TVS NTorq 125. In terms of pricing, the Hero Destini 125 is the most affordable 125 cc scooter available in the market right now. 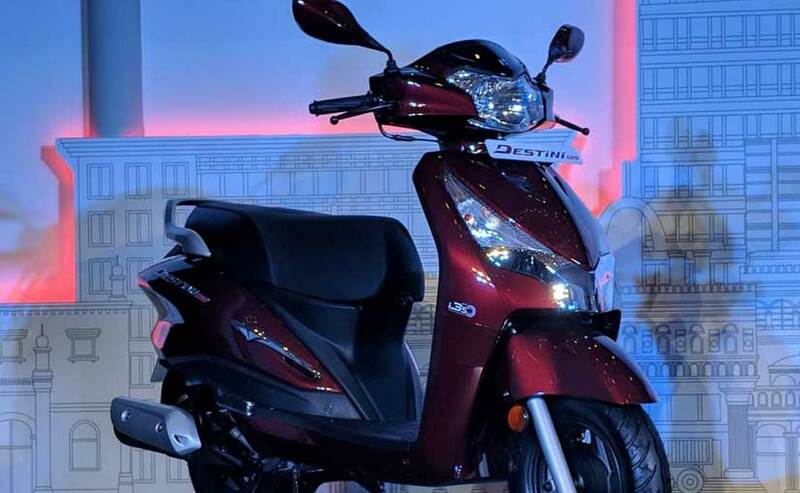 Although Hero officials have not divulged any expected sales numbers, the new 125 cc Hero scooter is expected to be a sales volumes driver for Hero.